No. 1 and No. 2 meet Friday for a dual competition for the fifth time since 2007. Of those five, Florida’s been a part of four. The Florida-OU dual airs live on FOX College Sports Pacific. Meg McDonald and Olympian Kelly Garrison Funderburk call the action. On the go Friday? Follow the action on FOXSportsGo<https://urldefense.proofpoint.com/v2/url?u=https-3A__www.foxsportsgo.com_program_524056_womens-2Dcollege-2Dgymnastics-2Dflorida-2Dat-2Doklahoma-3F-5Fbranch-5Fmatch-5Fid-3D619173213680086993&d=DwIF-g&c=pZJPUDQ3SB9JplYbifm4nt2lEVG5pWx2KikqINpWlZM&r=6MG06PG_fwpe7ULfewi6NrFR2j_4ngNZtgGHhDCeRY0&m=GojYzEPY2YgWa361727gvjqsxJ1F3RipBqaLuN9d0X8&s=n78gAm1AtmxOOyguP6kYtAghv7ps3nZ-SJqMW0wiOOA&e=>. 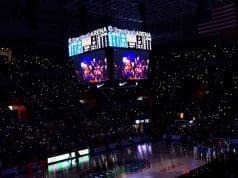 A school-record bars set helped boost Florida to a season-best 197.675 Friday in front of the Exactech Arena’s 10th highest gymnastics crowd of 8,615. No. 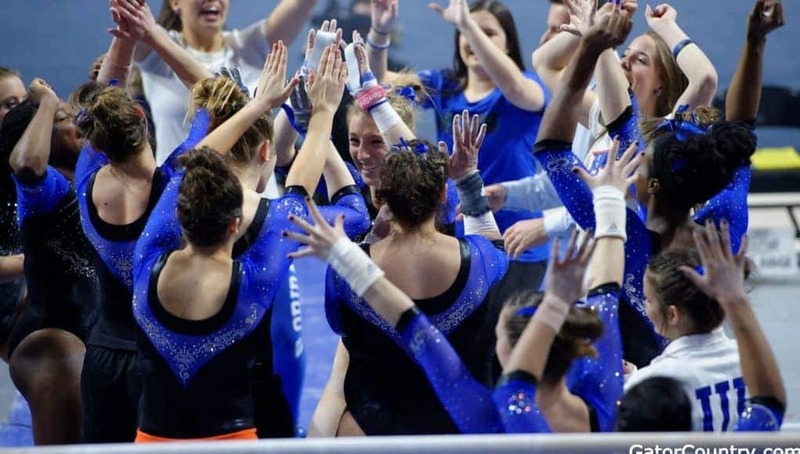 17 Kentucky also posted a season-best 196.65 Friday. Freshman Trinity Thomas won three event titles outright – all-around (39.70), uneven bars (9.975) and balance beam (9.925). She shared the floor exercise title at 9.925 with senior All-American teammate Alicia Boren and Kentucky’s Mollie Korth. Boren started the Gators’ bars set with a collegiate-best 9.95 (and earning the No. 3 spot on the Jan. 25 SportsCenter Top 10<https://urldefense.proofpoint.com/v2/url?u=https-3A__twitter.com_GatorsGym_status_1089206078917824512&d=DwIF-g&c=pZJPUDQ3SB9JplYbifm4nt2lEVG5pWx2KikqINpWlZM&r=6MG06PG_fwpe7ULfewi6NrFR2j_4ngNZtgGHhDCeRY0&m=GojYzEPY2YgWa361727gvjqsxJ1F3RipBqaLuN9d0X8&s=rLdAP9WY9Cm-2CHWMVUpouloDS1qKPCAUN82fQfgd28&e=>) as each member of the lineup posted a 9.9 or better. The Gators’ 49.725 erases the previous bars record of 49.70 set in 2007 and ranks as the nation’s top total for any event so far this season. Thomas’ all-around shares the nation’s No. 2 total for 2019. She is one of five Gator freshmen to earn a nearly perfect 9.975 for bars. 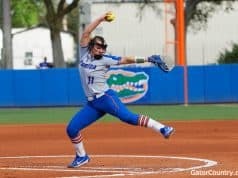 After their performances Friday, Thomas and Skaggs claimed SEC Weekly honors<https://urldefense.proofpoint.com/v2/url?u=https-3A__floridagators.com_news_2019_1_29_gymnastics-2Dtrinity-2Dthomas-2Dand-2Dmegan-2Dskaggs-2Dcollect-2Dsec-2Dweekly-2Dawards.aspx-3Fpath-3Dgymnastics&d=DwIF-g&c=pZJPUDQ3SB9JplYbifm4nt2lEVG5pWx2KikqINpWlZM&r=6MG06PG_fwpe7ULfewi6NrFR2j_4ngNZtgGHhDCeRY0&m=GojYzEPY2YgWa361727gvjqsxJ1F3RipBqaLuN9d0X8&s=Hh9F_Eg7iJMFmTWKO1SGtqQmM9KJVfWcpYC9ylT3Zd4&e=>. Thomas claims her first SEC Gymnast of the Week honor after winning four individual event titles. Her collegiate-best all-around title came after posting the nation’s top total of the weekend, 39.70. Skaggs is the SEC Specialist Gymnast of the Week after upping her collegiate bars best for the second time this season. Her 9.95 tied for second overall. This is the fourth meeting between Florida and Oklahoma in a 371-day span. When the two teams met in Gainesville on Jan. 26, 2018, Florida edged Oklahoma by 0.025. The two teams met in both sessions at the 2018 NCAA Championships, with the Sooners winning by 0.463 in NCAA Semifinal I and taking second by a 0.1875 margin over the third-place Gators. This is the 11th consecutive meeting between these two programs that includes the No. 1 ranking. Five of the last six NCAA team titles were claimed by these two teams, including sharing the 2014 crown. 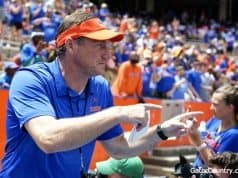 Florida won title outright in 2013 and 2015 and Oklahoma took the 2016 and 2017 titles. Oklahoma has posted the top three team totals of 2019, including opening the season with the leading mark of 198.05. The Sooners are led by junior Maggie Nichols, the defending NCAA all-around champion and the 2019 leader with her average of 39.70. Nichols is also in the top 10 for each event, including leading the vault standings.